Clean windows can make the difference between a pleasant workplace and a dreary one. The mood of your employees can greatly depend on how much access they have to sunlight and the fresh air. Many scientists nowadays raise awareness on the consequences of dirty windows, and the main one being the sunlight deprivation. Of course, it is inevitable that your windows will grow dirtier and dirtier over time but with the help of the skilled rope access window cleaners at R.A.I.L., you will enjoy the neverending beauty of the undisturbed view over the city when your windows are clean at all times. Choose our company to perform rope access window cleaning and you won’t be disappointed! Window cleaning is quite tricky, especially in such severe conditions like hard access or extreme height. We can’t imagine our team working without a CSCS certificate or without the knowledge passed on international training like IRATA. 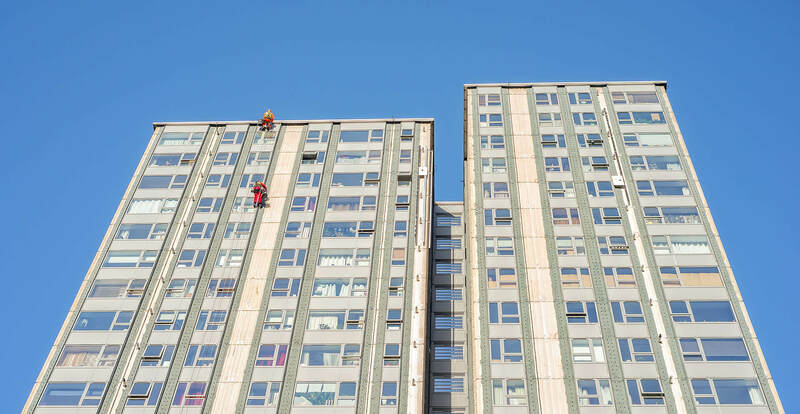 Thanks to our trusted, well-qualified team and rope access, our specialists can climb the face of your building with no harm or effort at all, providing you with a quick, efficient service. It costs you next to nothing, especially when compared to traditional work at height methods like scaffolding. It is also the safest method of window cleaning available on the market, so you risk the least by trusting in rope access. If you choose R.A.I.L., you can be certain to have the quickest booking and the most friendly team you can imagine. We work hard to provide you with the maintenance you desire in the most sustainable way. Contact with us to book our services fast and enjoy the clean windows!